If I were to sum up why I came to photography and why I still do it, it would be because I am in love with the elements of wind and rain, of feeling alive when I am in certain kinds of landscape. I've never been one to get distracted by the technical. I really don't care very much for f-stops or shutter speeds, nor for any fixation on resolution or any other technical aspect that leads me away from my belief that photography is about an emotional response; I love it because of what it allows me to feel. It is inspiration for me, to find a book that connects with the great outdoors on an emotional and also poetic level. 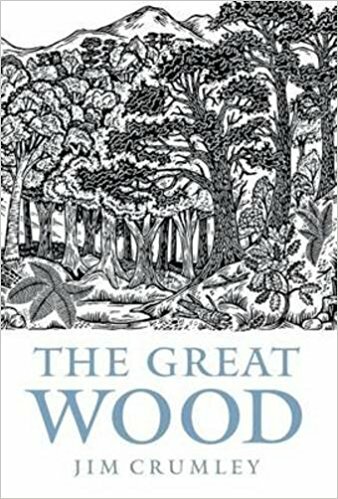 In Jim Crumbley's book 'the great wood', he writes so movingly about what was once the great forest that covered my native Scotland. It is a beautiful book. It is also book that does not use photographs. Instead it uses beautifully crafted sentences to conjure up a picture of what he feels about the landscape, and it is of great relief to me to be able to jump into my imagination by reading rather than looking. I need a break from looking at the world in pictures. We all need time away and we all need balance in our lives. Too much of one thing can cause burn out or for things to become stale. I appreciate that you may get your photography inspiration from looking at many photography websites (such as this one). But I do not. Instead, I manage to re-charge by retiring from the visual world. It is the contrast of looking at it from a literary side that seems to act as a form of respite. Too much looking at pictures, pictures, pictures leads to everything looking and feeling the same. By reading words instead, I am able to conjure up mental images that seem to be more effective than any photograph could be. As landscape photographers, I believe that each one of us is really a naturalist at heart, though some of us maybe don't know it yet. We may have come to landscape photography through a love of technical things like cameras and f-stops, or we may have come to landscape photography through an appreciation for the outdoors. Whatever the catalyst, sooner or later, we all become spellbound by the beauty of what is there. Put the iPad away, disconnect for a day. Go for a walk in the open air and see what's there. There's simply too much noise on the web now, and too many distractions with which to fill our time with, and most of it so transient that it will make no difference, except to rob us of valuable time spent where it's needed the most; outside. Go find your forest, a place where you can tap into your love for photography; It is out there somewhere. Just waiting for you.